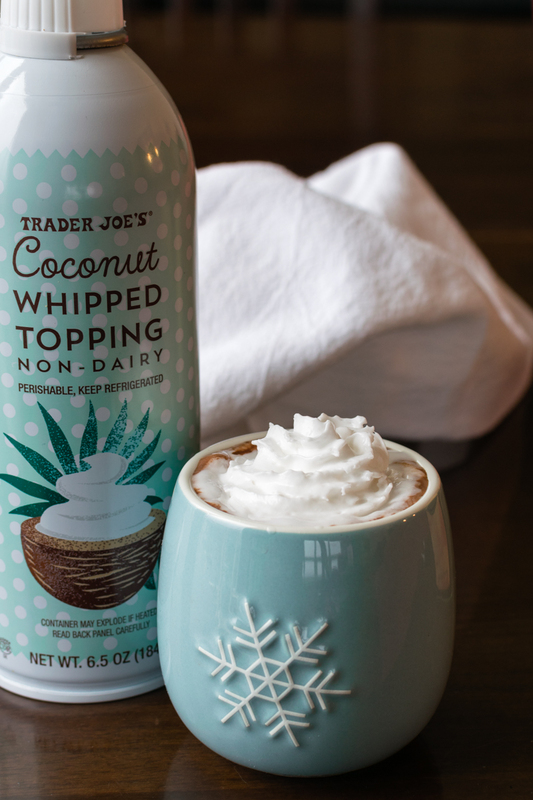 Whipped topping is a must for the holidays, and we have dozens of reasons to celebrate. This essential guide includes numerous dairy-free and vegan whipped cream products and recipes. Be aware that some “non-dairy” whipped toppings actually contain milk-based ingredients. (See this post for details: Non Dairy vs Dairy Free: Why One May Contain Milk.) However, we only share products and recipes that are free of dairy ingredients. So eat, drink, and generously dollop the following creamy dairy-free toppings. 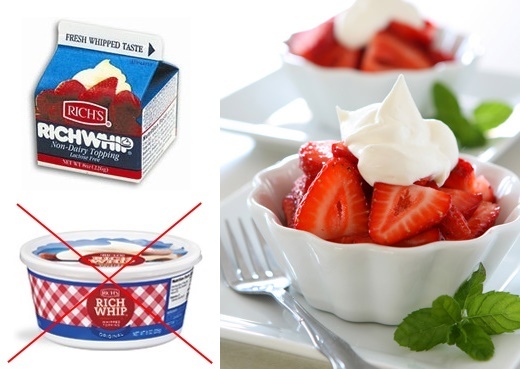 Most brands of whipped cream tubs do contain dairy, even the “non-dairy” ones. But there is one beloved brand that carries the dairy-free name. A few brands have come and gone from the market in years past, but I think CocoWhip is here to stay. It’s available in Original and Lite, and I think it’s the closest dairy-free thing you will find to that Cool Whip tub. It also works very well as a topping and in recipes. CocoWhip is sold in the freezer section at natural food stores and many conventional grocers. It is now available in the U.S. and Canada. 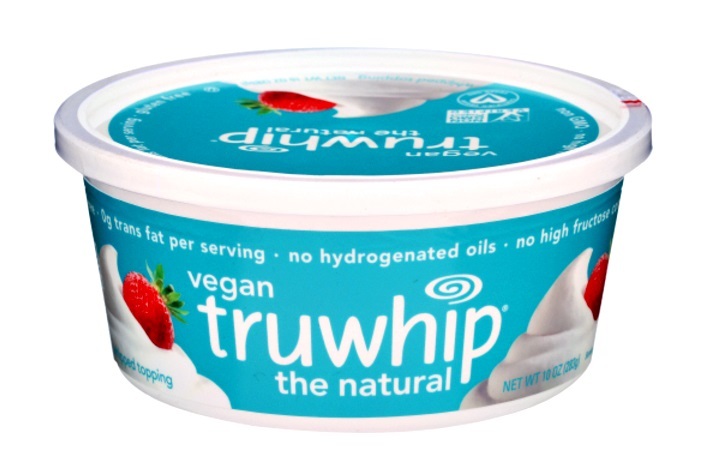 Not to be confused with the other Truwhip “non-dairy” products (which do contain a small amount of milk protein), new Truwhip Vegan is made without any dairy ingredients. And it’s a great option if you aren’t a fan of coconut. But this brand does contain soy protein, and is made with palm kernel oil. To the best of my knowledge, you should be able to find this product in the U.S. and Canada. This is the fastest growing segment of the dairy-free whipped topping market. Their are brands produced and available worldwide. 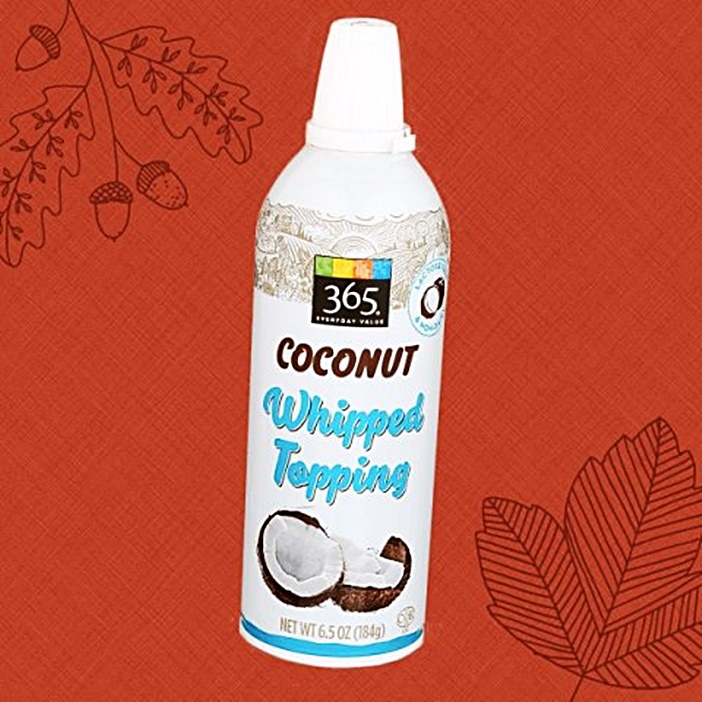 The newest non-dairy whipped cream on the block is Trader Joe’s Non-Dairy Coconut Whipped Topping made with real coconut cream. It’s very easy to find if you live near a Trader Joe’s, and when we bought it for just $3.29. Look for it in the refrigerated section next to the milk beverages. NOTE: Trader Joe’s temporarily discontinued the spray whip to work on a defect with the spray nozzle. All reports are that the product will come back, we just don’t know when. Whole Foods offers their name brand 365 Coconut Whipped Topping in a spray can. 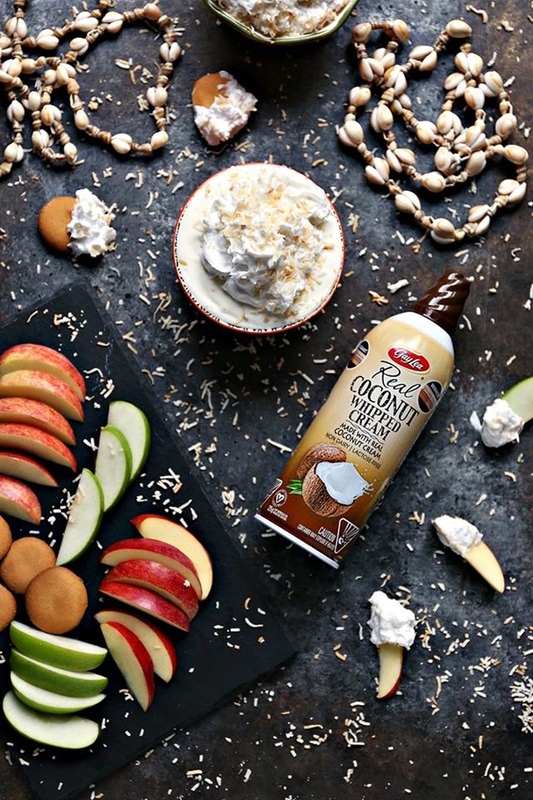 This dairy-free and vegan whipped cream is currently available only in Whole Foods stores. But it could make an appearance on Amazon in the future. Or at least we hope it will! Tofutown (A German company) makes Soyatoo and soy-free Rice Whip. They are popular vegan whipped cream options that have been available for quite some time. This spray whip is sold in some natural food stores, like Whole Foods, but can be tricky to find! I’ve linked up to Amazon, but shops like Vegan Essentials sell them online, too. 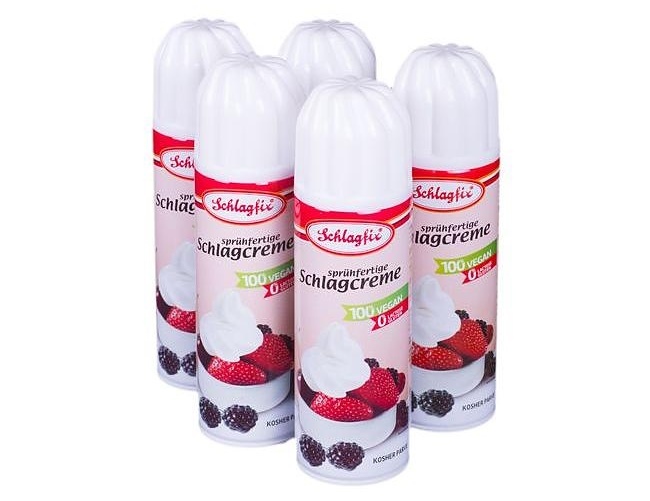 Another German brand known as Schlagfix makes a spray vegan whipped cream that’s made from a base of palm kernel oil, soy protein, and a bunch of other chemical-sounding ingredients. Nonetheless, many people really like it and think it tastes “less artificial” than others. I haven’t seen this one in the U.S., but it is available in Europe. The first coconut spray whip to be released in North America was actually Gay Lea Real Coconut Whipped Cream. It’s a dairy-free and vegan whipped cream, but they have other spray whipped creams which are not. This brand is sold in stores in the U.S., but they don’t have a store locator. However, Vegan Essentials usually carries it online. 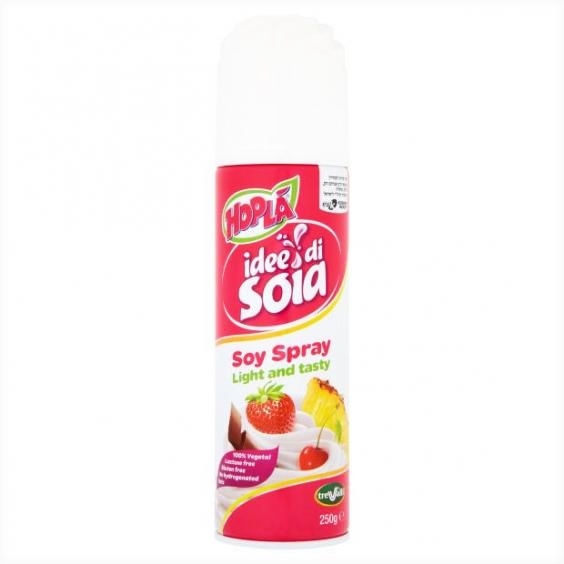 In the U.K. (at Sainsbury’s and perhaps elsewhere) you can get Hopla Soy Spray Cream. It’s made with a base of coconut oil, palm kernel oil, cocoa butter, sugar, and soy proteins. But be warned that not all Hopla Whipped Cream products are dairy free. Some do contain milk protein. The red canister appears to be the vegan version at this time, while the green canister contains dairy. Reddi-Wip finally released their dairy-free versions in 2018. It was originally slated to be labeled “Dairy Free,” but instead has become the new Reddi-Wip Non-Dairy. It looks like they have discontinued the Reddi-Wip Non-Dairy that contained a small amount of milk protein. All of the products in their traditional line now contain Real Cream, and boldly contain dairy. 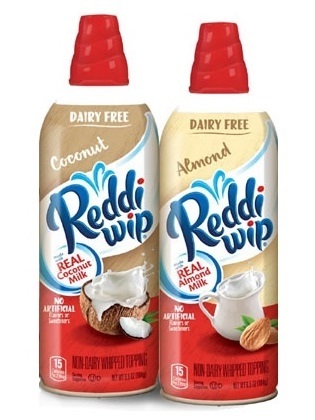 The new dairy-free Reddi-Wip Non-Dairy is available in Almond Milk and Coconut Milk versions. 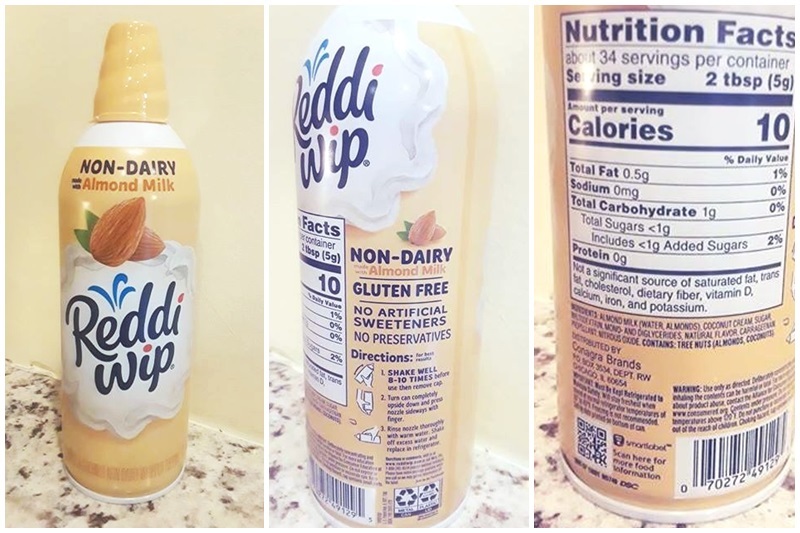 Reddi-Wip Non-Dairy (Almond Milk) Ingredients – almond milk (water, almonds), coconut cream, sugar, maltodextrin, mono- and diglycerides, natural flavor, carrageenan, propellant nitrous oxide. Contains: tree nuts (almonds, coconuts). 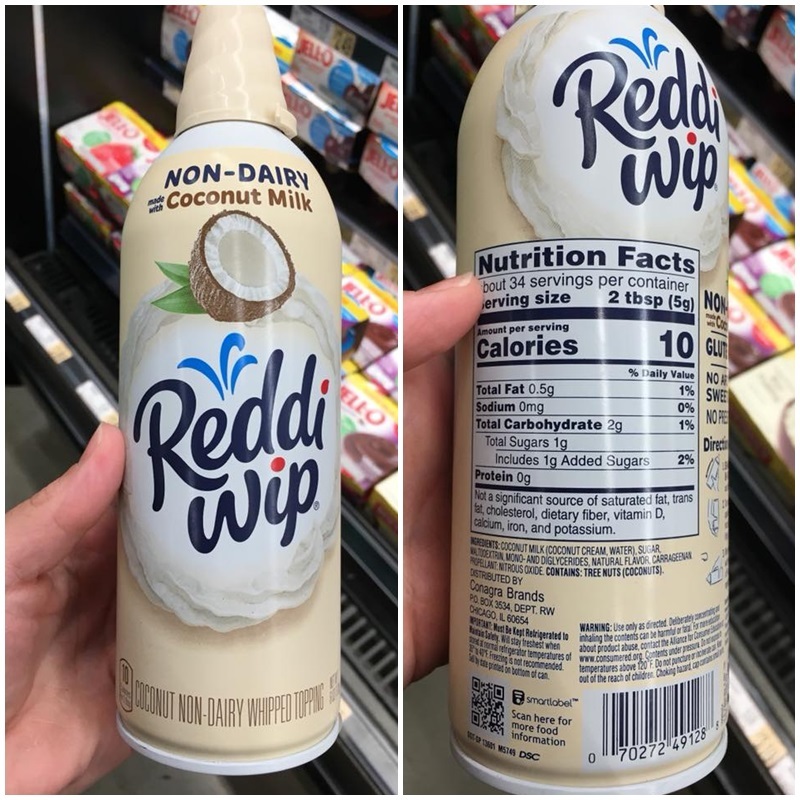 Reddi-Wip Non-Dairy (Coconut Milk) Ingredients – coconut milk (coconut cream, water), sugar, maltodextrin, mono- and diglycerides, natural flavor, carrageenan, propellant nitrous oxide. Contains: tree nuts (coconuts). 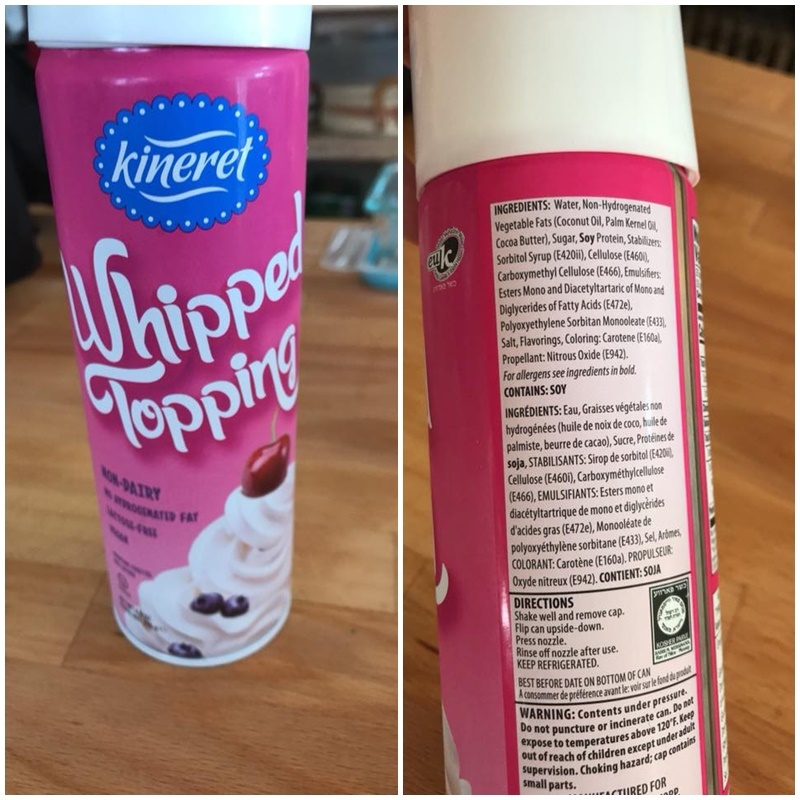 Kineret Whipped Topping Spray is made by the kosher company Kayco, and is not only dairy-free, but also certified kosher parve. Thank you to Jeaneth G. for providing the photos below, complete with the ingredient statement. It is sold in the refrigerated section in U.S. grocers, but is a product of Italy. These are “whip your own” varieties. They are usually sold as shelf-stable, but some might be found in the refrigerated section. Like the spray whips, there are brands worldwide, but these can be a little harder to locate. For a “whip your own” dairy-free option, try Rich Whip Ready-to-Whip Carton. Rich’s is an old-school kosher brand that has actually been around for many decades, but not all of their products are dairy-free. Like so many other non-dairy toppings, Rich’s Pre-Whipped Bowl Toppings do contain casein (milk protein) and should be avoided by dairy-free and vegan consumers (see the images below). Fortunately, since the products are produced and packaged differently, the Ready-to-Whip Cartons are not only a good vegan whipped cream option, they’re also certified kosher OU parve. However, the ingredients in Rich Whip Ready-to-Whip Cartons leave a little to be desired (high fructose corn syrup, hydrogenated oils, stablizers and preservatives). Tofutown also makes ready-to-whip cartons. You can get Soyatoo in Rice Whip, Soy Whip and Cocoa Whip. These shelf-stable cartons can be found in natural food stores, or online. 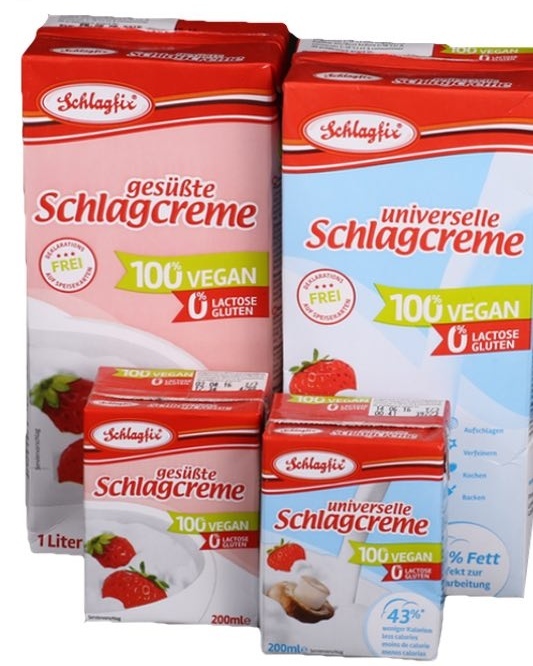 In Europe, the online store VeggieStuff is a great place to find these products. And Schlagfix makes their own Schlagcreme ready-to-whip cartons in sweetened and unsweetened. I have seen this option on Amazon, but in Europe, you can get it from online retailers like Veggie Stuff. And perhaps it’s also sold in stores. In addition to their spray whip (above), this brand also has a ready-to-whip product. 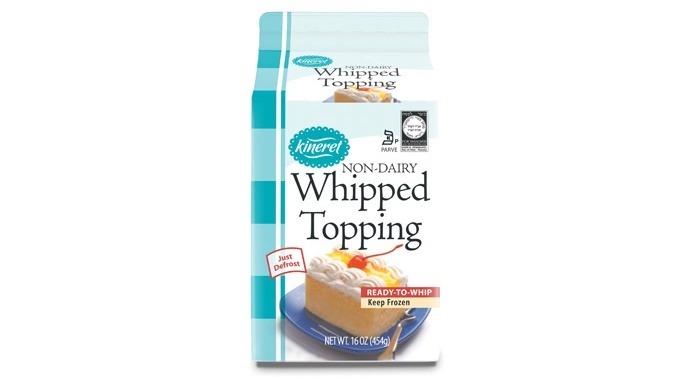 Kineret Ready-To-Whip Whipped Topping is also dairy-free and certified kosher parve, and it’s produced in a nut-free and gluten-free factory in the U.S. But it isn’t shelf-stable. This product is actually sold frozen. 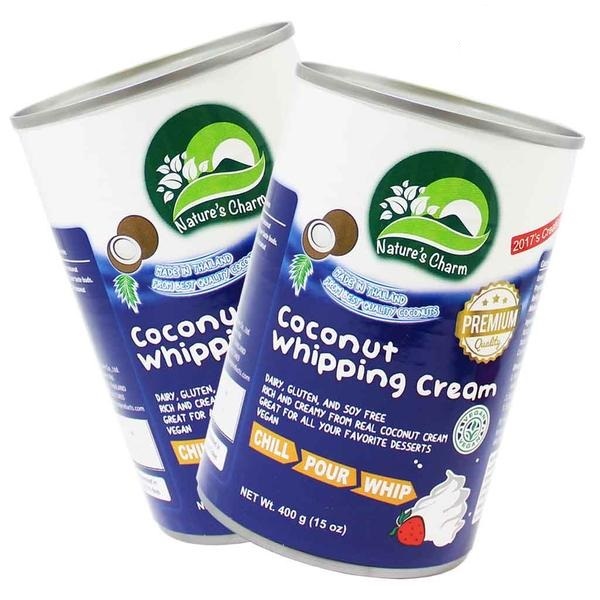 Nature’s Charm Whipping Cream subtly came onto our radar. It’s canned, and reportedly works in whipped cream chargers. It contains just coconut cream, coconut oil, coconut sugar, and guar gum. Keep in mind that these are not Cool Whip copycats, but they are delicious, rich, creamy, healthier, and perfect for topping those pies. 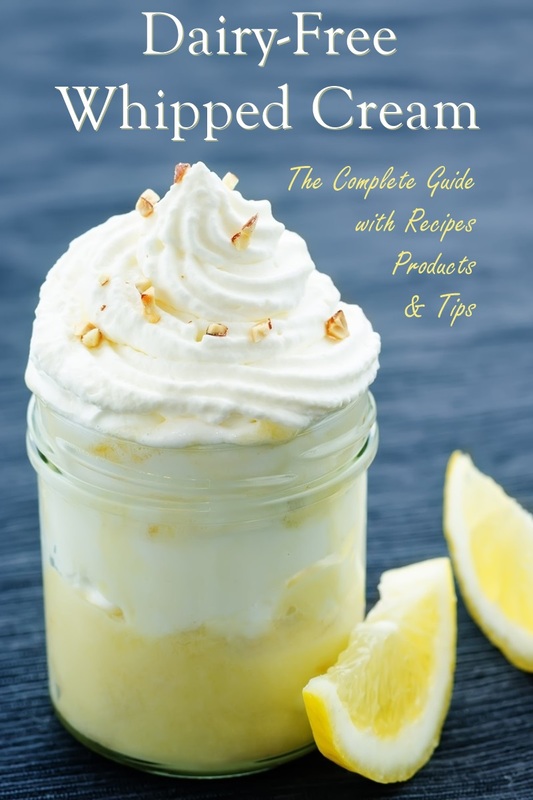 I love whipped coconut cream so much that I even have flavored whip recipes in Go Dairy Free: The Guide and Cookbook. The recipes are impossibly rich, creamy, and simple. 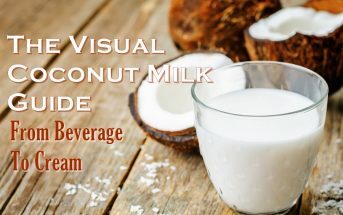 Like dairy cream, coconut cream is high in saturated fat. Saturated fat, unlike the unsaturated fats in most oils, solidifies as it cools to help create a thick cream. In other words, coconut cream acts very much like dairy cream, but it has a coconut vibe. 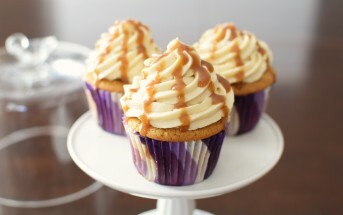 Most people either don’t mind or love the coconut flavor, which can be mellowed with vanilla extract or even chocolate! But the completely coconut averse may want to consider some of the other vegan whipped cream recipes that I will discuss. Foolproof Dairy-Free Whipped Cream – This is my go-to easy recipe with tons of tips to ensure perfect results every time. Creamy Berry Whipped Topping – This is a variation on one of the Whipped Coconut Cream recipes in Go Dairy Free. 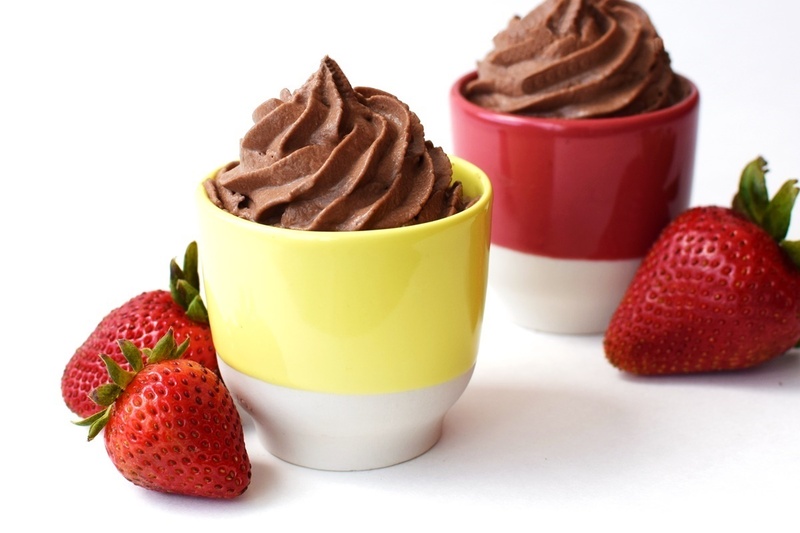 Chocolate Whipped Cream (pictured below) – You can eat this delicious cocoa whip with a spoon! Cashew Whipped Cream – This amazing-looking cream is from Chef Tal Ronnen. Yes, the vegan chef that Oprah made famous! Almond Cream – A Go Dairy Free reader took ordinary nut cream a step further by adding a thickener and stabilizer. He uses almonds rather than cashews. Almonds are a firmer nut, so this recipe may benefit from soaking the nuts overnight first. Mom’s Mock Whip Cream – This recipe was shared by a milk allergy mom. Her family loves this frosting-like whip. It’s definitely an indulgence, but isn’t that what the holidays are for? Veg-Whipped Cream – This recipe uses very basic ingredients, and can technically be made soy-free, but it is the most finicky of the bunch. Once you master the technique, it works well, but not everyone has success right out of the shoot. Consider yourself warned! Light Tofu Whipped Cream – Even today, after all of the many dairy alternative inventions, we can’t talk about subs without mentioning tofu. This low fat topping is still an old standby for many. For delicious ways to use vegan whipped cream, see our Dairy-Free Holiday Pie Round-up. For additional holiday and everyday recipes from my kitchen, see Go Dairy Free: The Guide and Cookbook. And for information on store-bought, dairy-free alternatives and products, see Our Product Reviews. 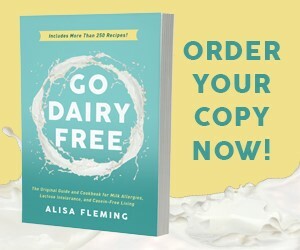 Meet the Expert: Alisa Fleming is the founder of GoDairyFree.org and author of Go Dairy Free: The Guide and Cookbook for Milk Allergies, Lactose Intolerance, and Casein-Free Living. 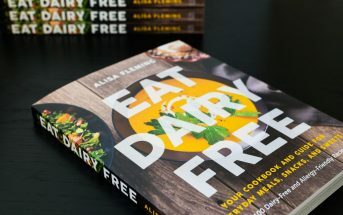 In addition to her own dairy-free lifestyle, Alisa has experience in catering to the needs of various special diets, including gluten-free, soy-free, egg-free, vegan, and multiple food allergies, and is Editor for the international publication, Allergic Living Magazine. Need Go Dairy Free now? Order the E-Book for immediate delivery. It is available for your Kindle or via Google Play. Regular Cocowhip is lovely, the light is not fluffy, and does not hold up at all. I am not at all fond of the lids on either product. They are very difficult to get on and off. Do not bother with Soyatoo Whip,,the sprayer does nit work, and you will be throwing you money away. Good to know, thank you Carrie! I’ve never been successful in making an allergy-friendly whipped topping that my son will actually eat. We tend to just do without which is fine because we really don’t need the extra sugar. If something REALLY needs sweetener, I just make a sugar icing and blend with fruit instead of food dye. That’s a good idea – thanks for sharing Elizabeth! I have only used homemade whipped coconut cream, but the store bought options do look good!! You really should try the So Delicious one Jenn – it’s a surprise experience! I love the so delicious coco whip. I also love rich whip too. Thanks! Good to know Dani, I haven’t tried Rich Whip yet! Homemade coconut whip is my number one fave. 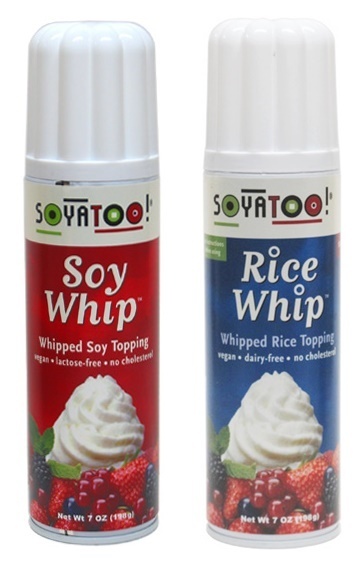 But for convenience, I love the soyatoo soy whip in the aerosol can! I haven’t had large success with non-dairy creams. I do prefer the canned soy whip over the rice whip which tastes like chemicals. I don’t like coconut, so I must try the nut creme recipes above. Good to know – I hadn’t tried those two spray whips yet! I love the So Delicious Coco Whip. Even my husband, who is not a vegan, prefers this to any other whipped cream or whipped topping. Now that is high-praise. Thank you for sharing Stacy! I love to top my desserts with chopped nuts or cacao nibs! Ooh, cacao nibs, I hadn’t thought of that! I’m pretty amazed by the cocowhip by So Delicious, so creamy, sweet, and yum. I LOVE whipping coconut milk for my toppings, it’s so easy & yummy. thanks for sharing this. Fascinating – I’ve never tried it, I’ll look into that one – thanks for sharing Saniel. 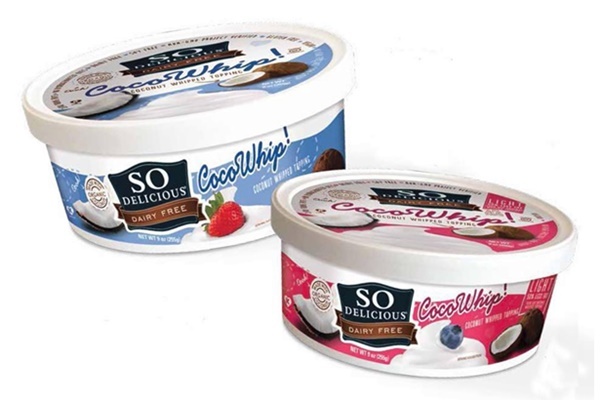 That So Delicious Coco-whip is addicting, hard to have in the house because it is great just plain with a spoon! But I’ve tried it on desserts, in my version of banana pudding, in coffee and as a dip for strawberries. 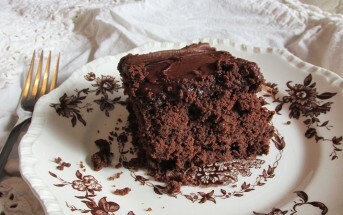 Thanks for posting your recipe as well! In coffee?! That’s crazy unique but I bet it is awesome. This is a dairy-free website – no dairy milk, no dairy cream. Links are within the post Robyn – they either go to the company website for information on purchasing, or direct to purchase. I know at least one of these has a milk warning on it, because I’ve checked the label the lat 2 years! Dairy free and vegan labels are notorious for “may contain milk” warning labels. It’s irritating, as our son has a true milk allergy that could kill him. I completely understand your frustration. But please note that “may contain” warnings are completely VOLUNTARY. A product that states “made in a factory with …” may actually be safe due to their rigorous cleaning but desire to disclaim for safety while another product without a label warning may actually be totally unsafe (since they don’t have to put may contain on it). If dealing with a serious milk allergy, you MUST always contact the manufacturer no matter what the package says. I know milk allergy moms who comfortably buy certain products with “may contain” warnings after speaking with the manufacturer, but shun others without the warning because they couldn’t get clear answers from the company. Also, with milk, know your risk factors – if the company is using milk powder in the facility, it can float – for example – where liquid milk may easily be washed away and wouldn’t “float” to other equipment.